Sculptor Thomas Barlow carves up cylinder ice luminaries for part of this year's Triumph Winterfest Friday at the Covered Bridge in Vail Village. 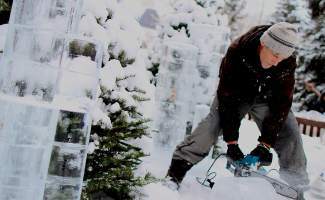 The ice artistic piece will come alive at Vail's tree lighting ceremony this Sunday. What: Logan Luminescence, an ice sculpture installation by artist Thomas Barlow. Where: Slifer Square, near the Covered Bridge in Vail. When: Exhibit unveiling takes place in conjunction with the Vail Holidaze tree lighting at 5 p.m. Sunday. More information: Enjoy hot chocolate, entertainment, and paper lantern’s created for Vail’s Paper Lantern Project. Visit www.artinvail.com or call 970-479-2344. The last time sculptor Thomas Barlow displayed public art in Vail, it was for a competition, which he won. It was 1989 and Vail was hosting the World Alpine Ski Championships; Barlow’s team won first place at the ice sculpture contest. The idea involved a fountain within a fountain, at a quintessential Vail spot. That might not sound so big if you don’t know what a block of ice weighs. Each block weighs around 300 pounds. Which puts into perspective the current installation Barlow is working on right now near the Covered Bridge in Vail as part of Triumph Winterfest. “In total, we used 50 blocks,” Barlow said. For those of you who don’t like math, that’s an impressive 15,000 pounds of ice. We caught up with Barlow on Thursday as he was headed down to Loveland in a commercial flatbed truck he rented to pick up his second load of ice. “We forklift the ice onto pallets and then onto the truck,” he said. Barlow began installing the icy luminaries Friday morning and finishes up today, in time for Sunday’s unveiling of the exhibit, which is titled Logan Luminescence after sponsors Kent and Vicki Logan, who are part-time Vail residents. The unveiling takes place in conjunction with the Vail Holidaze tree lighting at 5 p.m. on Sunday in Vail Village’s Slifer Square by the Covered Bridge. The exhibit includes 70 cylindrical ice lanterns in varying dimensions that will transform Slifer Square into an atmospheric ice and light installation. A few chandelier type lanterns will hang from the surrounding trees. Much of the cutting was done prior to the installation using a computer that was programmed with the dimensions. For the first year, the annual Triumph Winterfest ice sculpture installation will include two separate installations by two separate artists: “One during the holidays in Slifer Square, along with the traditional Triumph Winterfest exhibition on the Gore Creek Promenade, which opens Jan. 17,” said Art in Public Places coordinator Molly Eppard. Local ice sculptor Paul Wertin was chosen as the artist for the Gore Creek Promenade exhibit by the Art in Public Places board. Barlow began his sculpting career in the culinary industry at Chicago’s Hilton International Drake Hotel. His innate skills did not go unnoticed. He was quickly promoted and recognized for his creativity in three-dimensional sculpting of fruits, vegetables and ,eventually, elaborate cake designs. Barlow moved to Colorado in 1987 and settled in the Roaring Fork Valley. Launching his own business, he became sought after for his talents as a pastry chef and ice sculptor. He’s been sculpting in a variety of mediums — ice, wood, sand, snow, cake — for more than 25 years, he said, and has received numerous awards and been exhibited throughout the country and overseas. For more about Barlow, visit http://www.thomas-barlow.com.